In November, I will participate on a panel at the Nation Congress of American Indians annual conference in Portland, Oregon. The session is entitled, “Advancing Tribal Communities through Participation in the Digital Age”. The session will focus on broadband broadcasting and new technologies for disseminating information. The session will be November 1, 2011 from 1:30 to 4:00 pm at the Oregon Convention Center. The country overall has begun its transition from analog to digital media and communications services. In order for Indian Country to be competitive and productive participants in the national and global economies, tribes must actively expand, create, and retain access to broadband services. This session will focus on various forms of funding criteria available to tribes for the establishment of tribally owned and operated telecommunications, and also highlight benefits to healthcare, education, and tribal governance through utilization of broadband services. With every step and every action we take as Native people and sovereign nations our footsteps carry us toward a new era of tribal prosperity. The ever-increasing depth of our cultures, strength of our traditions, and diversity of our Native resources serve as a guide on the path to reaching the new meaning of tribal prosperity; defined by the health of our people, the strength of our sovereignty, and the vibrancy of our nations. 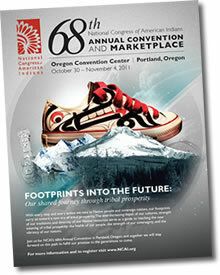 At NCAI’s 68th Annual Conference in Portland, Oregon we celebrate together, the journey our ancestors embarked on generations before us. As we step forward together on this path we fulfill our promise to the generations to come.